Saturday the 7th of november…..Kamitei accompanied Johana to her house to tell her family that she became one of the Eagle Scholarship students! 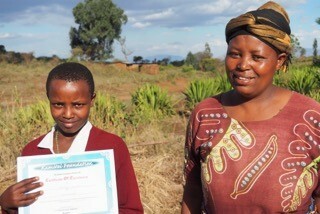 Her mother immediately told the headteacher of Kilimatembo how grateful she was for the effort they took to give Johanna the education which made this possible. She promised Johanna a gift when she passed the exams……New Shoes! And she planned to make chicken soup for that evening!